There was some rumble in the world of modelling kits. Revell, one of the most famous hobbyist brands had to apologize for a new model kit: a model of the notorious Haunebu Nazi Flying Disc. 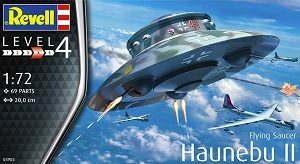 The story of so called Nazi UFO's or Flying Discs is now less obscure as it used to be. Due to the internet information highway and even some Hollywood shows the public domain is now more aware of the strange technologies the Nazi's may have possessed. The Nazi's had a different approach towards technology compared to todays technology. The roots of the Nazi movement are in the old and ancient secret societies of Germany and beyond. Most well known are the Thule Gesselschaft and VRIL society. They believed in Atlantis and the use of an energy form: Vril. The name Vril is the shortening of “VRI-IL” which means “Like God”. Officially Vril was “The All German Society for Metaphysics” which merged with the Thule Gesellschaft and the obscure DHvSS (Men of the Black Stone) in the year 1919. With the Nazi Party in power in 1933 (which itself originated from the Thule Gesellschaft) the occultists now received official backing for their continued development of the flight discs. Thule and Vril started with the RFZ (RundFlugZeug, or Round Aircraft series from 1937-41. As war had started in 1939 the RFZ-5 became the Haunebu 1 and by 1941 the RFZ-7 had become the Vril 1 Jäger (Hunter). The reason for the changes were due to Thule’s revolutionary Triebwerk (Thrustwork) engine that used rotating electro-magnetic-gravitic fields to affect gravity. Vril had by 1941 perfected the SM-Levitator as well and thus two new series entered limited construction, but with slightly different goals. Thule wanted to develop both a production combat craft and a functional Raumschiff (Spaceship). Vril, by comparison, only wantedto develop Raumschiffe to reach Aldebaran in the Taurus Constellation 64 light years from earth. As Hitler had forbid secret societies in Germany from 1941 forward, both Thule and Vril were documented under the SS Technical Branch Unit E-IV (Entwicklungsstelle 4) tasked with developing alternative energies. This unit had already helped with the RFZ series but now “officially” Thule and Vril did not exist. Vril became known secretly as “Die Kette” to both their Abwehr and Ahnenerbe (Ancestral Heritage Research Department, a.k.a. Nazi Occult Bureau) connections. Illustration of Vril “Z-Plan” of future return to earth in the early 21st century. The model, based on a spacecraft beloved by Nazi conspiracy theorists who believe Hitler & company managed to build incredibly advanced technology and then … never actually used it, comes in a 69-piece kit, complete with box art of the fictional flying saucer waging war against Allied forces. The issue here isn’t so much the existence of the model itself, or the fact that it’s fictional and Nazi-themed. Revell makes models of fictional vehicles from a number of properties, from “Star Wars” to Halo, as well as historical aircraft from all sides of World War II. However, the documentation and packaging of the model have drawn serious ire for not making it clear that the flying saucer never actually existed. Revell described the model as though it were an actual historical craft, noting that it could travel “up to speeds of 6,000km/hr (3,700mi/hr)” and that it was “the first object in the world capable of flying in space.” None of the over-the-top description comes with the disclaimer that it’s all false, and that’s not a great look for a company that sells toys. After receiving harsh criticism, Revell has decided to yank the product entirely. The company said it totally understands the outcry and that the heat it is getting is “absolutely justified” and apologized that it failed to “adequately express” that fact. It seems that the Revell Haunebu modelling kit is back on the shelfs. The prices are somehwat expensive, depending on your budget. If you enjoy making modelling kits and have an open eye for the strange and exotic Nazi technologies then this may be a fun way to build your own Nazi Flying Disc. Das Ist Verboten (it's forbidden) No More. 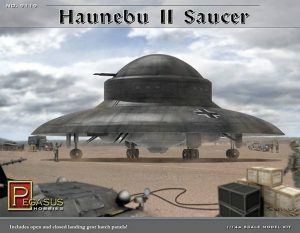 Bytheway: Revell is not the only modelling brand with a Nazi 'UFO' in their collection of models. The other brands are Squadron Models and... Pegasus. In 1937 the occult Vril Gesellschaft (Society) began its continued disc development program with official Nazi Party backing under Professor W.O. Schumann of the Technical University of Munich who worked on the JFM (Jenseitsflugmachine) from 1922-1924. Professor Schumann had invented the SM-Levitator from the JFM research and now the time had come to put the device to work in a series of "Round Aircraft"- the Rundflugzeug series. The series began with the RFZ-1 which was constructed after the Vril Gesellschaft had purchased the fallow land surrounding the Arado Brandenburg aircraft plant for future flight testing. The RFZ-1 took to the air in 1937 on its first and only flight at Arado Brandenburg. The record of this historic flight did not end in success.